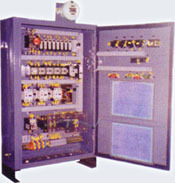 AMIN PANELS, One of the biggest manufacturer of low voltage Electrical & Electronics Control /Power panels, started its operation 1974.The plant is located on a 5km site at Anand (V.U.Nagar), near Baroda/Ahmedabad (Gujarat). It commands a major market share in its product range category. 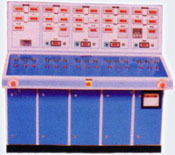 Major strength of Amin Panels are modern manufacturing facilities which include sheet metal workshop equipped with shearing Machine, Plate Bending Press Break Machine, Painting technology with bake up oven, tool room quality control systems including Test Benches as per IS and IEC standards and well equipped design center. 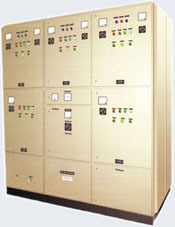 In addition to above modern equipment & machinery, we have skilled manpower, highly qualified experienced Engineers, supervisors, Inspector & services technicians for providing prompt & best services after sales requirement, also we have design center, which design the panel to meet the client’s requirement. In addition to above, we manufacture panels strictly adhering to the relevant IS / IEC standers, electricity rules and other applicable Specifications prevalent and as updated from time to time in this respect. Bus bar rating upto 3000 Amps. Compact compartmentalized design, extension on either side in future. Selection for top/bottom cable/bus duct entry. Design as per customer suitable size / specification. Floor / Wall Mounting option as per requirement. 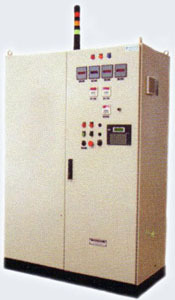 Ability to maintain a consistent high Power Factor. M/C Automation (PLC) Panel Eliminates the panelty of low power factor levied by electric utilities. 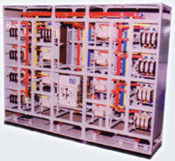 Facility to select different Capacitor Bank for selection. Up to 400 KVAR. Auto / Manual mode selection Facility. Increase life of Capacitor. Power Distribution Board Battery Charger panel. PLC Based suitable for I/O Application, Optional with MMI Interface Keypad. AC/DC Drive Based Suitable Complete with input Choke, Line & Load Harmonic Filter, Facilty to Synchronizing two or motoe with techo/encoder feedback option, Interlock with other process. Control Desk with MIMIC Display option with different sizes. Panel Boxes (Ready to wire), Terminal Junction Box , PB Station, Bus Duct. Different Size up to IP 65 Protection. Floor / Wall / Pedstal Mounting option. We undertake modification (Renovation) job of existing old system (Panels) to new system, which suits to all latest specification.